18-19 March 2015. Tripadvisor describes it as one of the Twenty surreal places you need to see to believe. I’d been there forty years ago but have little memory of it except for the steam rising from the ground and the rotten-egg smell of sulphur. 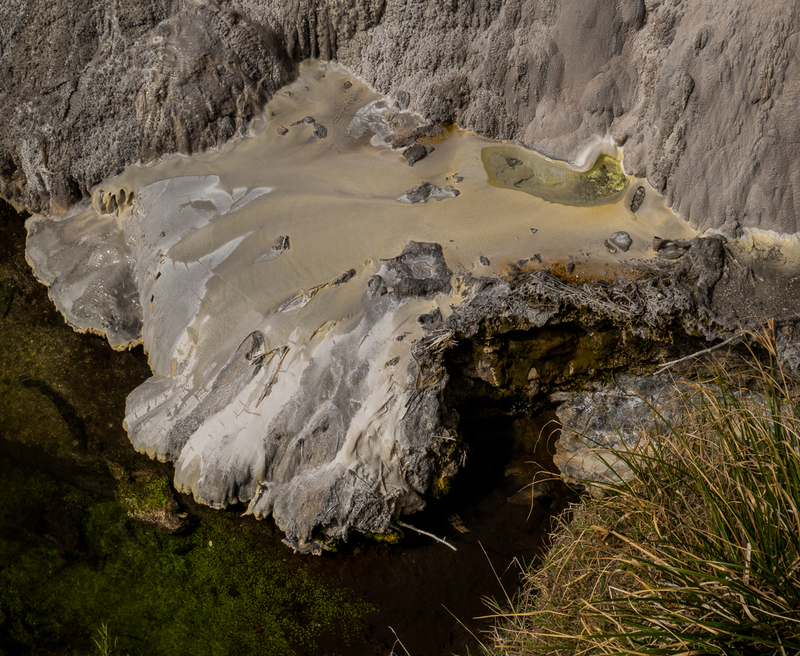 When we first enter Waiotapu (Maori for sacred waters), we are drawn into a grey and white craggy steamy landscape, white cliffs of textured chalk, grey and ochre-coloured deep jagged pits, steam rising from caverns in the ground, steam coming from small sulphur-covered vents, and pools of boiling mud. In places the earth is black, and boiling. We are immediately aware of the restlessness of the earth beneath us. As we walk further we come to a spectacular dreamlike wonderland of steaming coloured pools with hot water flowing everywhere. It is at once dazzling and eerie. In all directions are land and water formations that almost defy description. Walking through this extraordinary setting we are spellbound and incredulous. I’m astonished by the surreal beauty, and by the immense variety of colours. And I’m madly puzzled. I don’t understand. What creates such a landscape? There are scientific explanations of course, but somehow they seem abstract and lacking in soul. We have entered an alien world. Any explanation would only detract from the experience. At the same time the mind craves understanding. Everywhere we walk we can hear the constant sound of boiling liquid, as if there is a huge soup bubbling away on the stove, but eerily it is the Earth beneath us that is boiling. 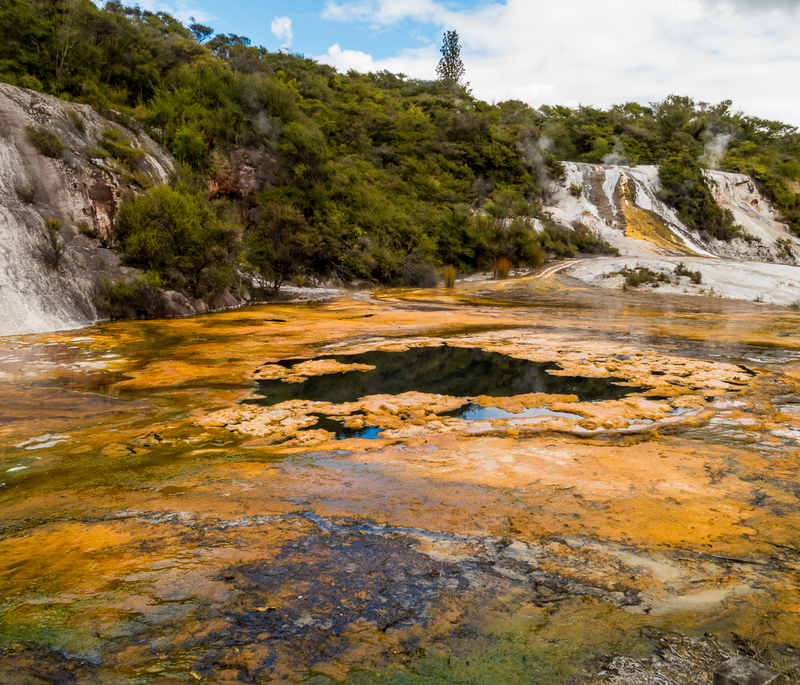 The geothermal area of Waiotapu covers eighteen square kilometres and is littered with collapsed craters, cold and boiling pools of mud or water, and steaming fumaroles. 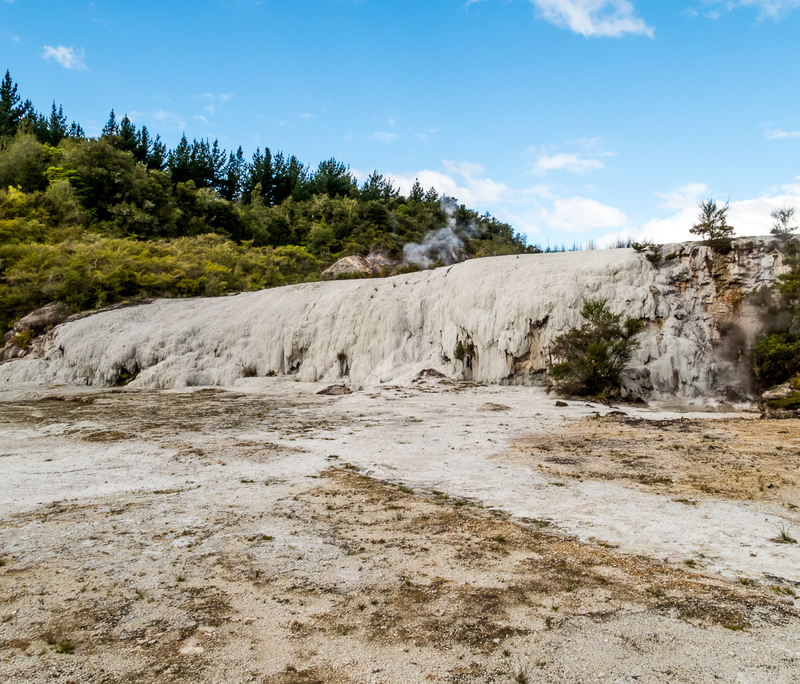 It is part of the Taupo Volcanic Zone, which stretches in a diagonal line across the centre of the North Island. 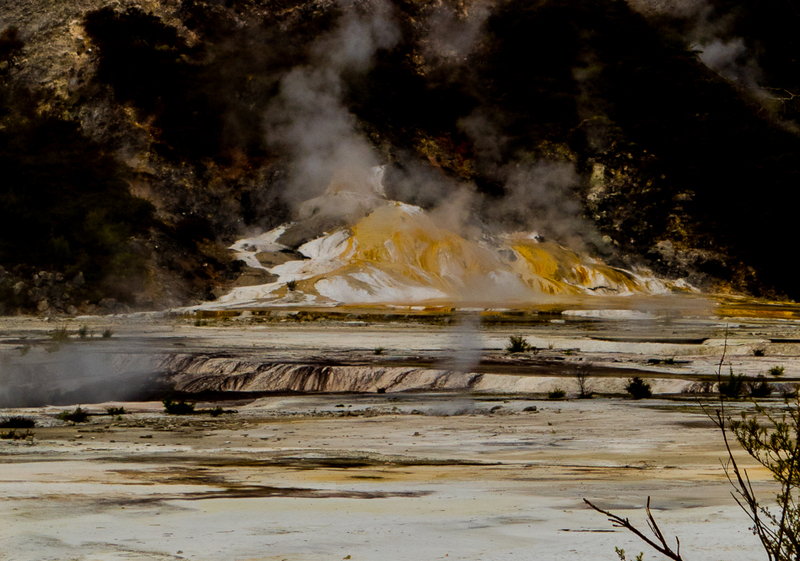 The zone is 250 kilometres in length and is one of the most active volcanic areas in the world. Beneath the ground is a system of streams heated by magma. When water is heated under the earth it must find a way to escape, and it frequently does so with breathtaking results. The water is so hot that it absorbs minerals from the rocks and transports them to the surface. 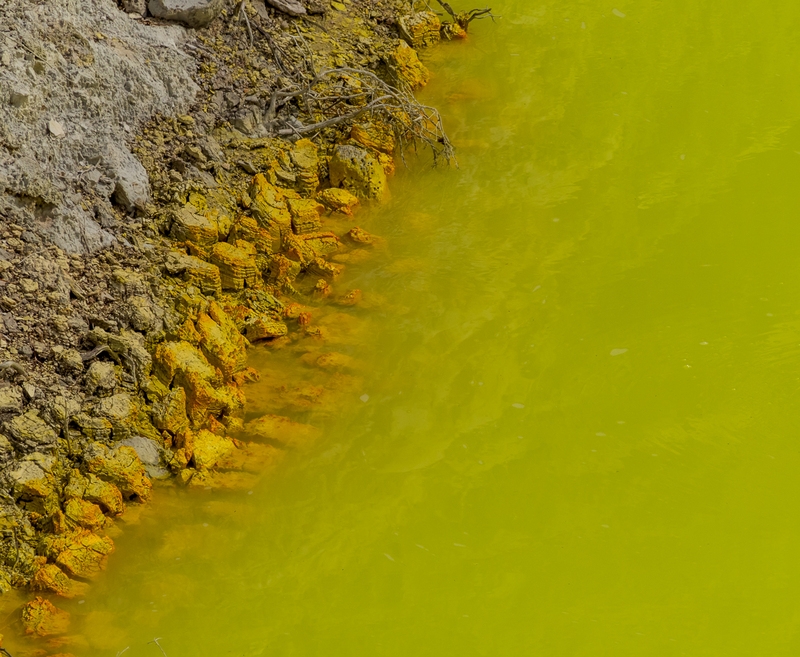 Yellow is from the presence of sulphur, green from ferrous salts. The earth’s crust is made up of a number of interlocking plates, which move independently like giant icebergs. New Zealand sits astride an active fault line where two of the earth’s plates are relentlessly colliding. In the South Island they meet and push upwards to form the Southern Alps. 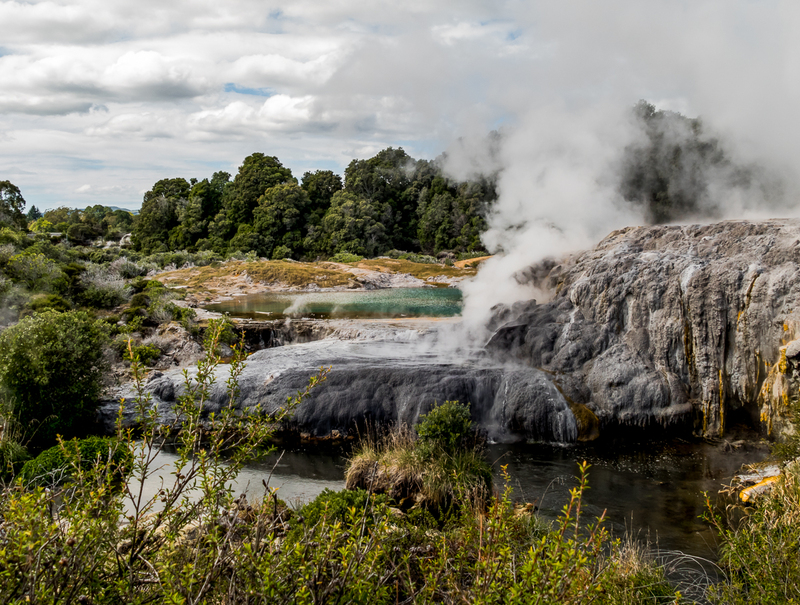 In the North Island one plate is pushing underneath the other, which creates a colossal amount of active subterranean heat and volcanic activity. We see the consequences of this subterranean activity all around us. The green on the left in the picture above is the edge of the Champagne Pool. The orange is created by the presence of antimony. 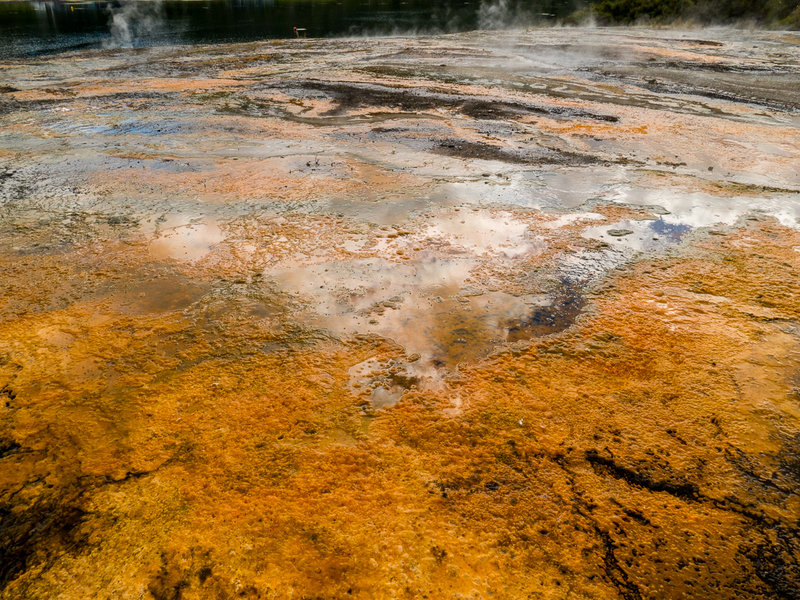 The Champagne Pool was formed nine hundred years ago by a hydrothermal eruption. 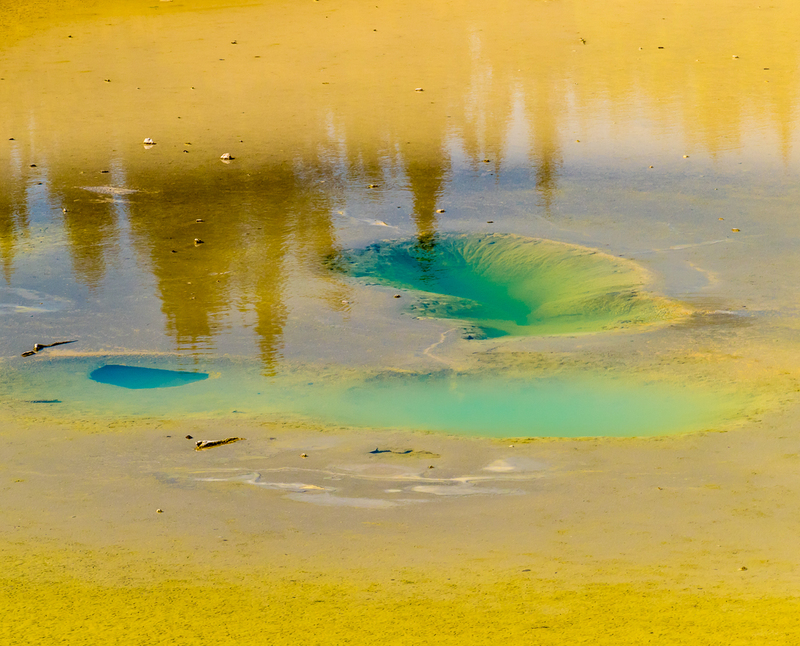 The resulting crater, filled with bubbling water made green by ferrous salts, is 213 feet in diameter and 203 feet deep. The water is 163 degrees Fahrenheit, or 73 Centigrade. The water below the earth is 500 Fahrenheit or 260 Centigrade. It’s barely comprehensible. 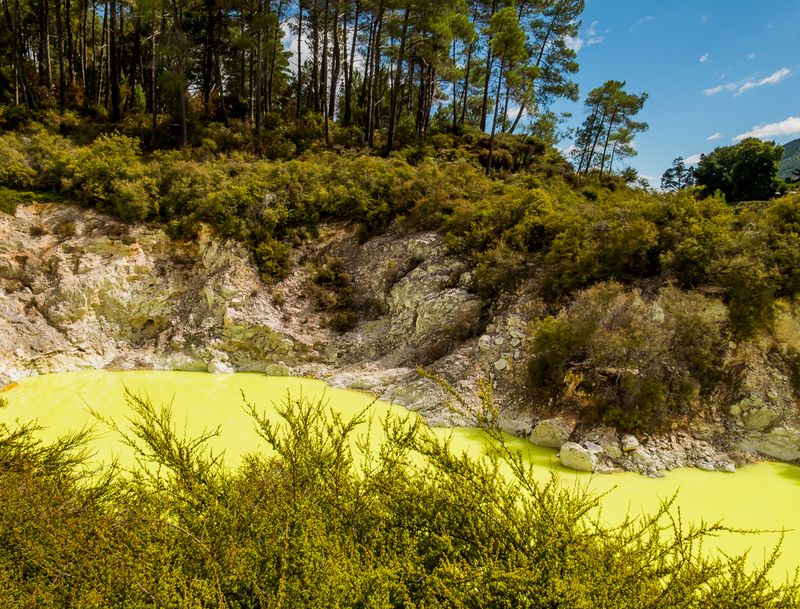 We thought we’d seen it all only to then arrive at this pool of milky intense chartreuse liquid. It is known as the Devil’s Bath. 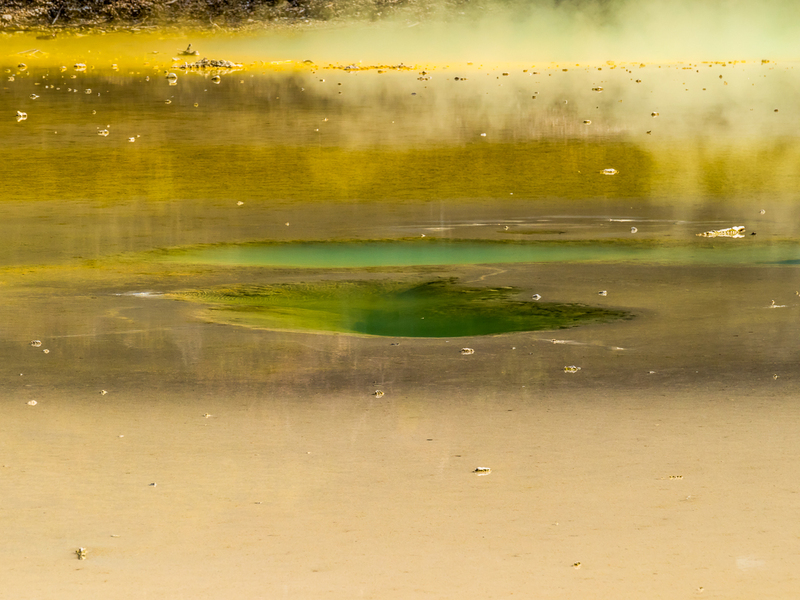 The colour of the water in this crater is the result of excess water from the Champagne Pool mixing with sulphur and ferrous salts. 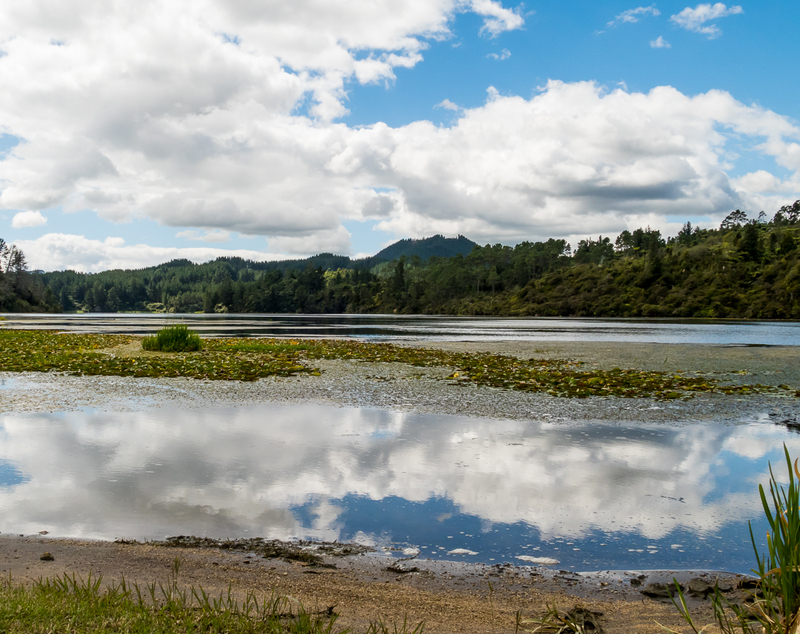 To reach Orakei Korako, “The Hidden Valley”, we take a short ferry ride across the Waikato River. 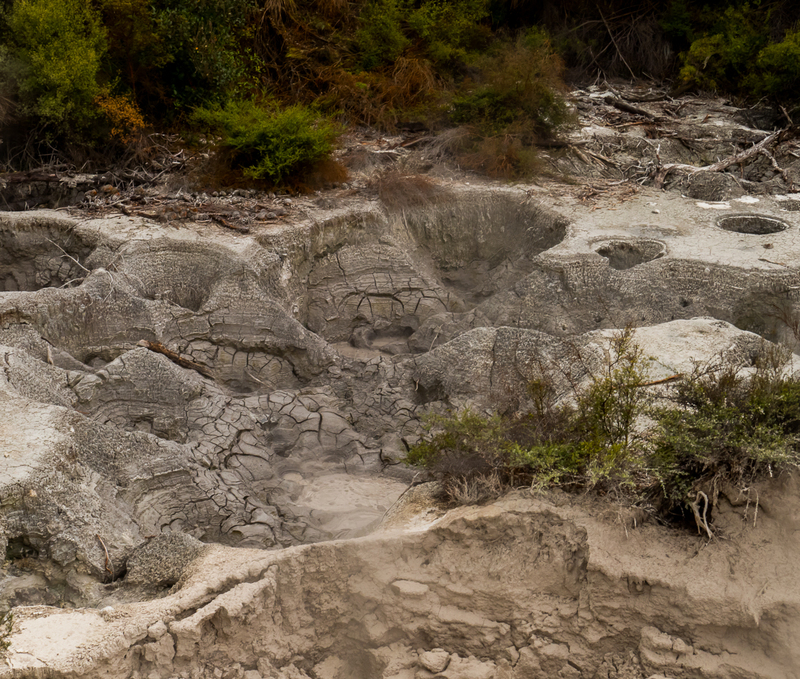 We thought Waiotapu was spectacular, but it was just the prelude. 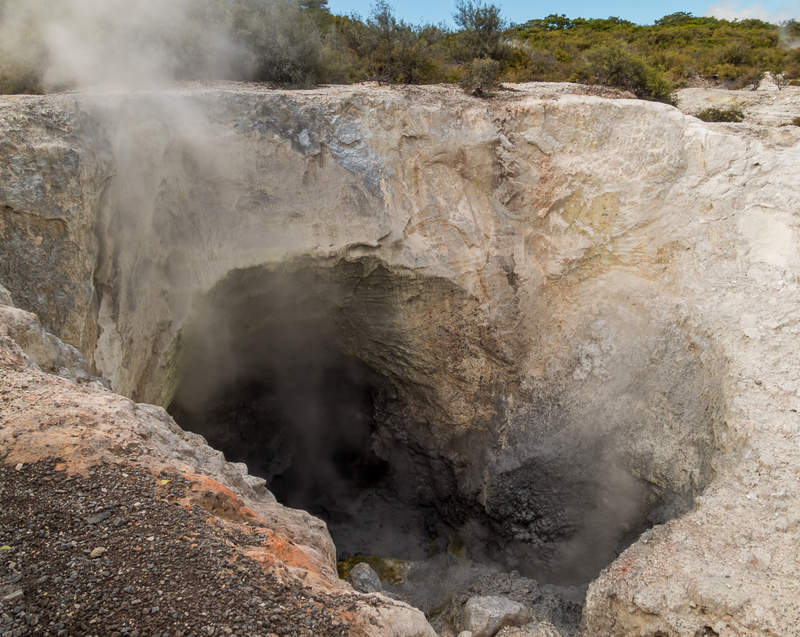 The scene at Orakei Korako leaves us gaping. 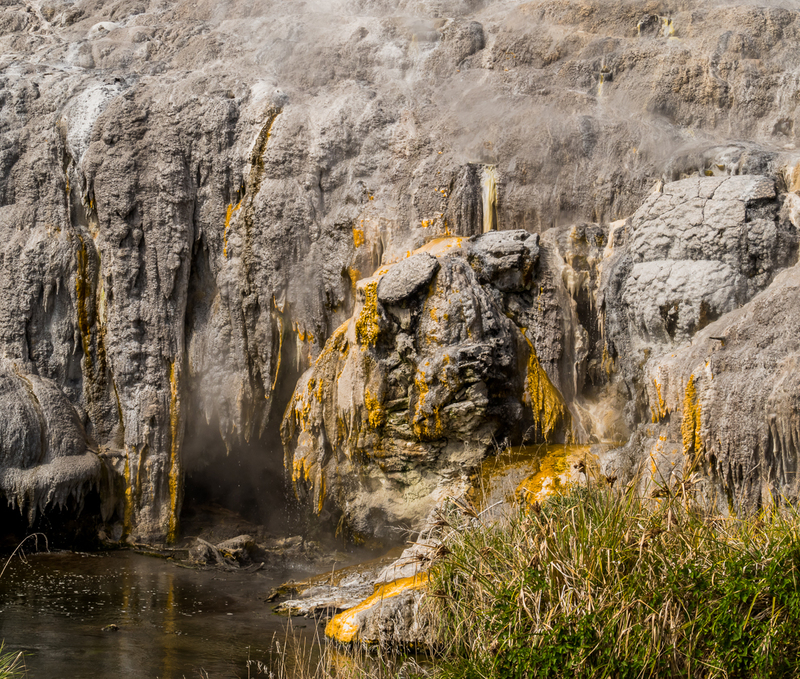 Bright orange and green terraces, white cliffs, water-filled craters, boiling mud, boiling water, and orange and white land formations that appear to flow as if they are liquid. The Earth seethes and boils around and beneath us, the underground heat creating a landscape of unique beauty. 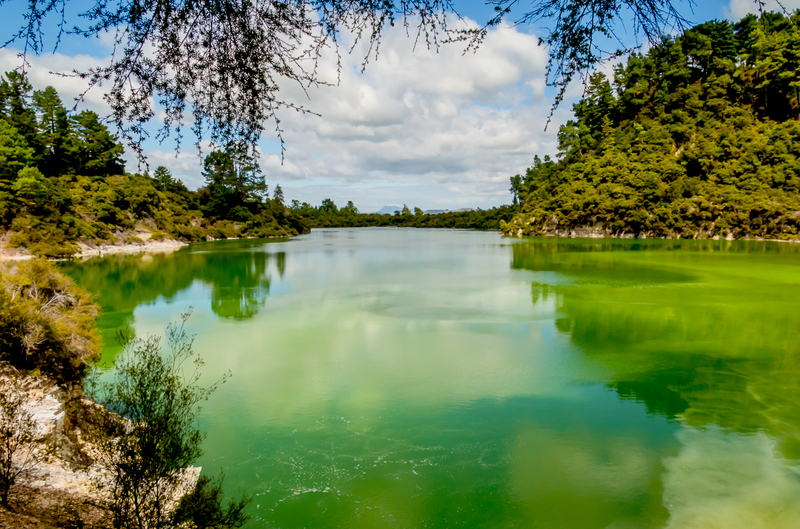 From the website of Orakei Korako: The hot springs, geysers and clear blue pools at Orakei Korako discharge alkali chloride water. This water ascends quickly to the surface from deep reservoirs where the temperature is hotter than 175°C. Upon discharge at the surface these waters cool. 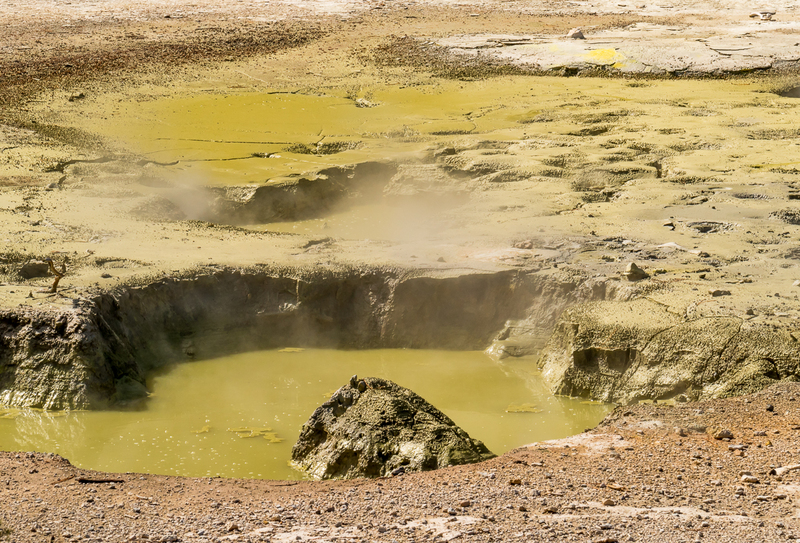 As they cool below 100°C, the silica that is carried in the water is deposited at the surface, forming the white silica sinter terraces. Sinter is rock that is formed over time by the deposition of silica from thermal water. Silica sinter is unique in the way it is not buried, yet it still transforms into rock. 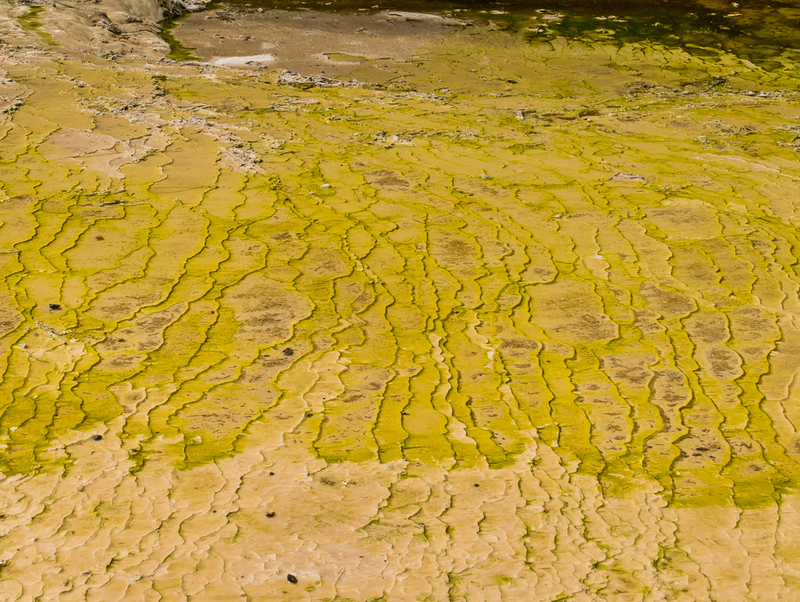 Different types of microbial mats cover the sinter terraces, the colour indicating the type of microbe. 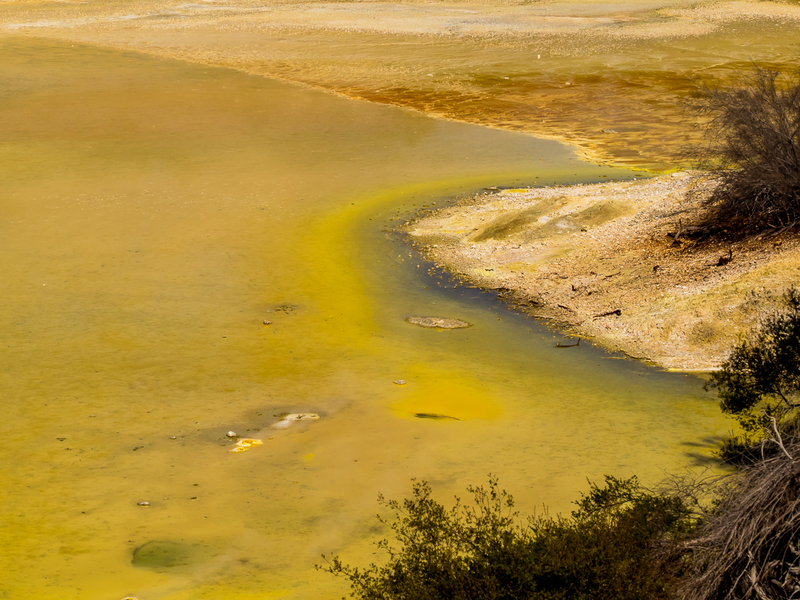 The microbes, tiny single-celled organisms, vary in colour according to the temperature of the water. 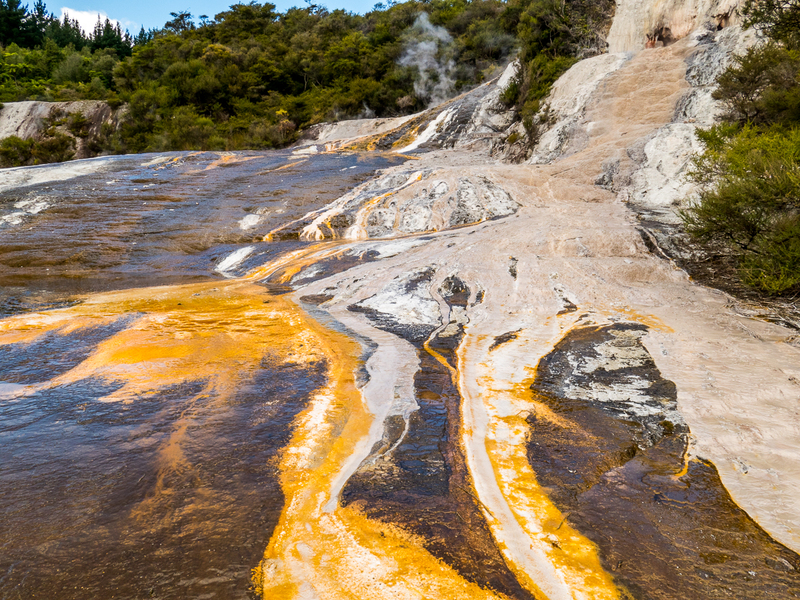 Unlike the orange and green colouring at Waiotapu, which come respectively from antimony and ferrous salts, the orange and the green seen on the sinter terraces at Orakei Korako comes from the microbes. 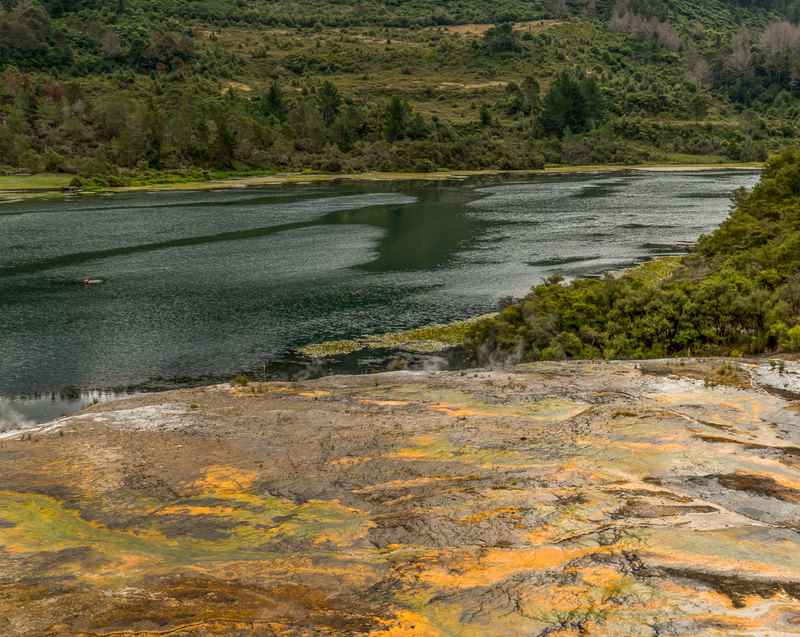 Orakei Korako has the largest silica terraces in the world, and at least twenty active geysers. 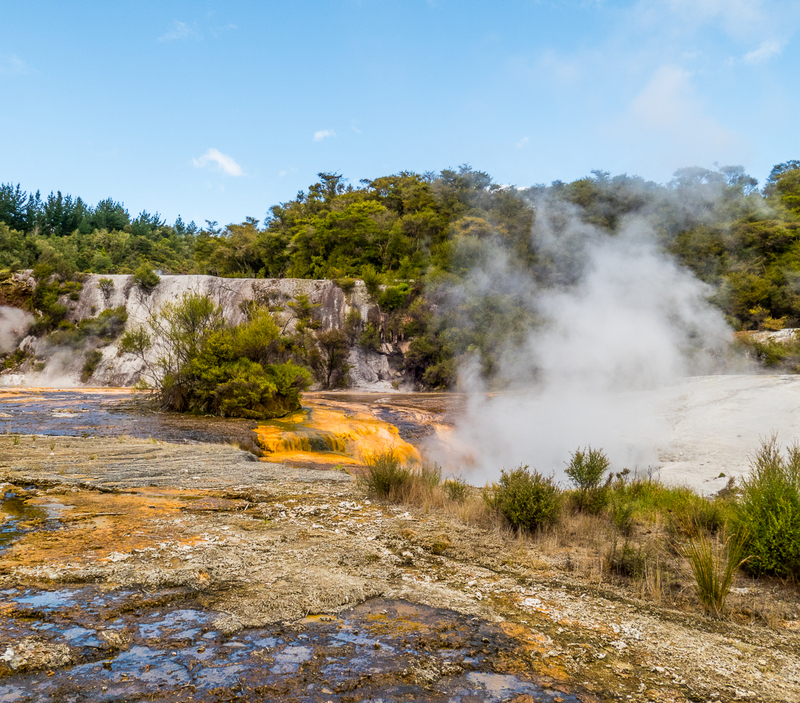 We visit one more area in the vast geothermal field of the central North Island, the Whakarewarewa thermal valley. The name is Maori for the gathering place. Whaka-rewa-rewa. Maori words are not so difficult if you break them down into sections, but even the locals reduce it to Whaka. Pronunciation, now that’s a whole other issue. 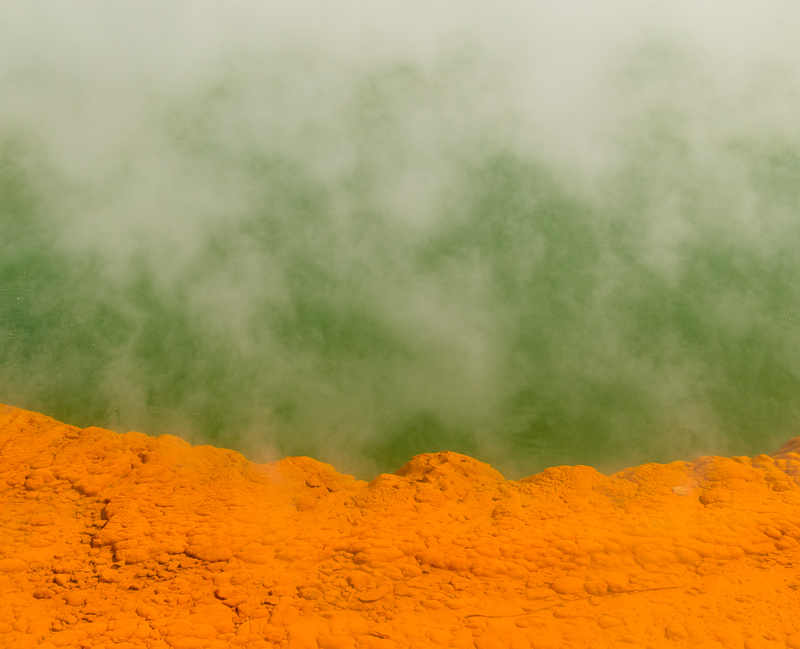 Once again we are met with an exotic sight: flowing water, flowing rocks, strange formations, bright sulphur pockets, pure aqua pools, and orange microbial growths. 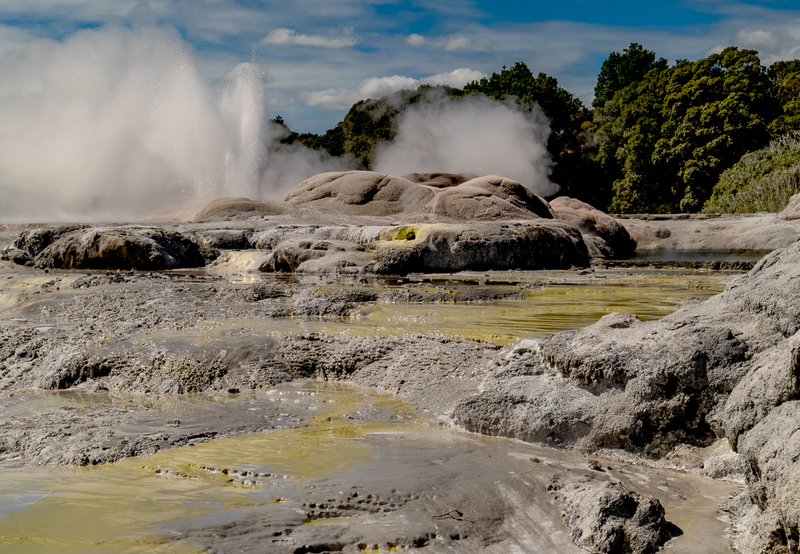 The most extraordinary jaw-dropping experience of the entire geothermal excursion is beyond doubt the Pohutu Geyser. 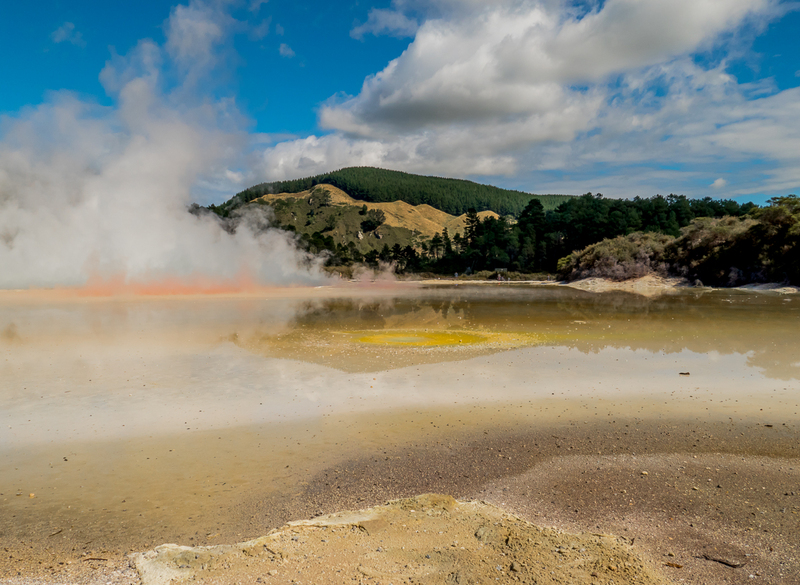 There are many geysers in the New Zealand geothermal fields. They are formed when pressure builds as the water underground reaches higher and higher temperatures and is then forced out through a very narrow opening. The result is a fountain of very hot water and steam. 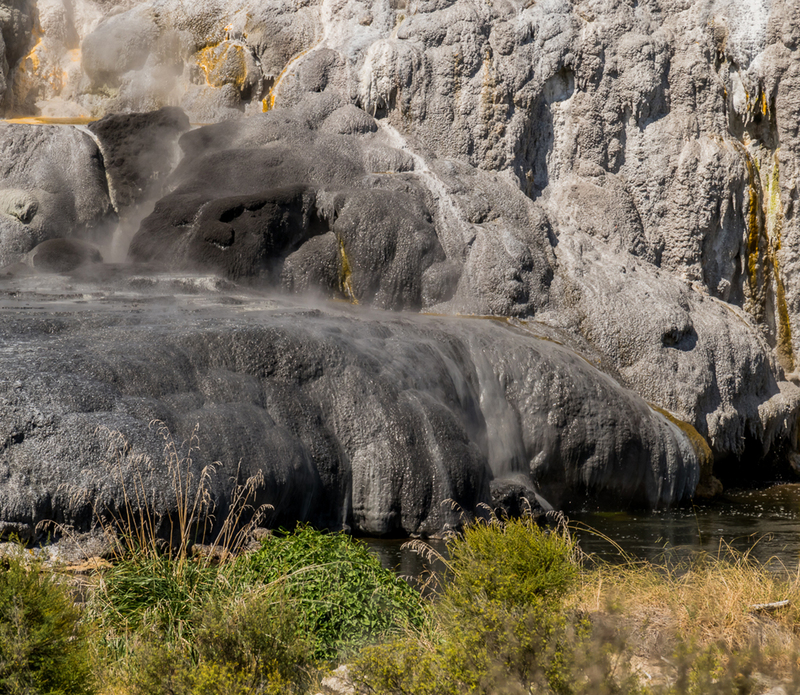 The Pohutu Geyser erupts up to twenty times per day, and sends steam and water as high as thirty metres, or one hundred feet, into the air. We are standing by the barrier waiting and waiting. Many in our group have wandered off, but most of us are waiting, determined to see what all the fuss is about. At first it starts bubbling and steaming. It looks a little like soapsuds frothing up on the rocks. We continue to wait. Is that it? Then it gets a little stronger, a little higher, but it’s still not all that spectacular. We wait some more. And then it goes. With a giant whoosh it explodes higher and higher into the sky, yes, as high as thirty metres. I’m afraid it will stop any second and that it will be over before I’ve had a chance to really take it in. But no. It goes on and on, shooting into the sky. A giant natural fountain of boiling water and steam. We watch for fifteen or twenty minutes and it’s still going when we walk away completely awed. My photo can give only a hint of the reality. Never for a moment think that the Earth is solid or still. The Earth beneath us is all powerful and is always moving. 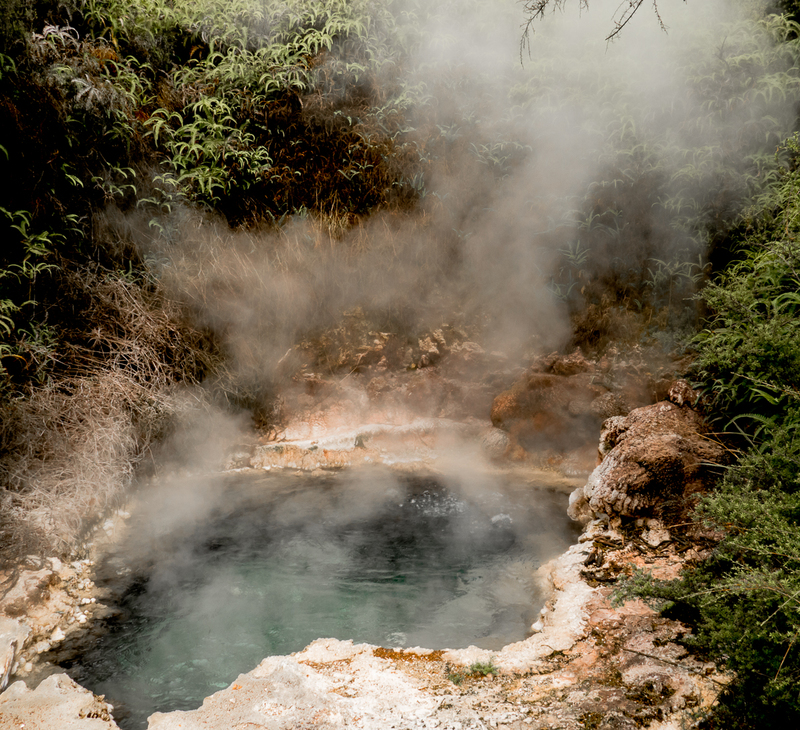 Of course a visit to the geothermal fields would not be complete without a soak in a hot spring, which we did of course: a sweet luxurious ending to one of our days of exploration. Next post: A deer farm, Stu the pig man, and some wildly creative garments from the matchless World of Wearable Art. All words and images by Alison Louise Armstrong unless otherwise stated. Thank you so much Emily. Congratulations on your up-coming marriage! 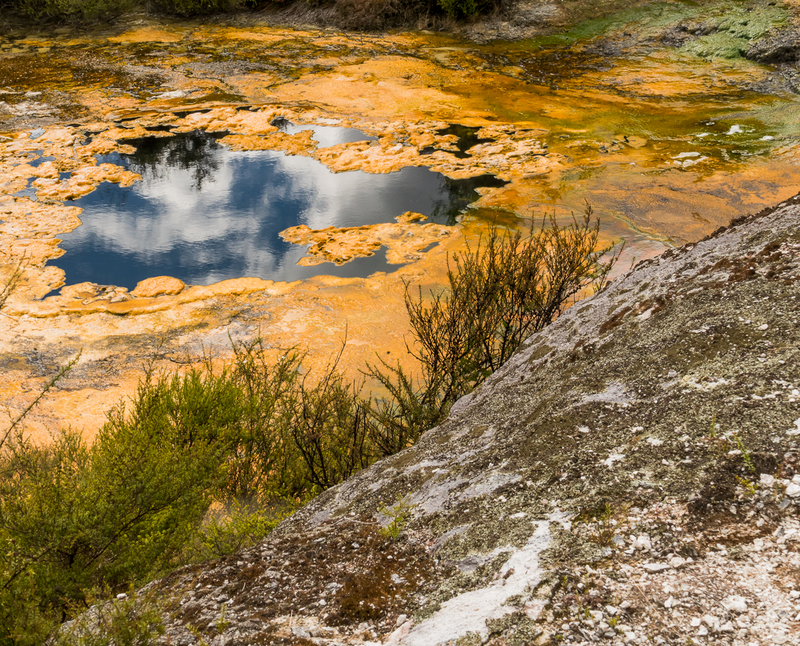 And do make sure you go to Waiotapu, it’s quite magical, and Orakei Korako too. They’re close to each other and we easily went to both in the same day. Wow! So beautiful and strange. I can’t believe your guide book didn’t give better coverage. Thanks! It was not dangerous at all really. There was clearly marked paths all the way through and the paths are stable so it felt safe. This area of NZ is part of the ring of fire. It’s pretty amazing isn’t it. I’d love to see that movie. The earth is like life I suppose – dangerous and serene both at the same time. What an extraordinary movie we live in. Isn’t it?! Astonishing and beautiful. Yeah, I know what you mean. That word kept falling out of my mouth over and over as we walked around. Thanks Jo. It was an extraordinary place to photograph. We were definitely boggled! We think it is all so stable and solid. And I suppose it is. Until it isn’t. Alison, thank you for another beautifully crafted post. Your words and photos work brilliantly together, giving us no doubt that you experienced a truly magnificent part of the Earth. We won’t make it to that region on our NZ trip in a few weeks as we’ll be spending slow time in the south of the South Island. I like the idea of saving some things for next time. Thank you so much Sue, I’m glad I was able to convey something of the magnificence of these places. 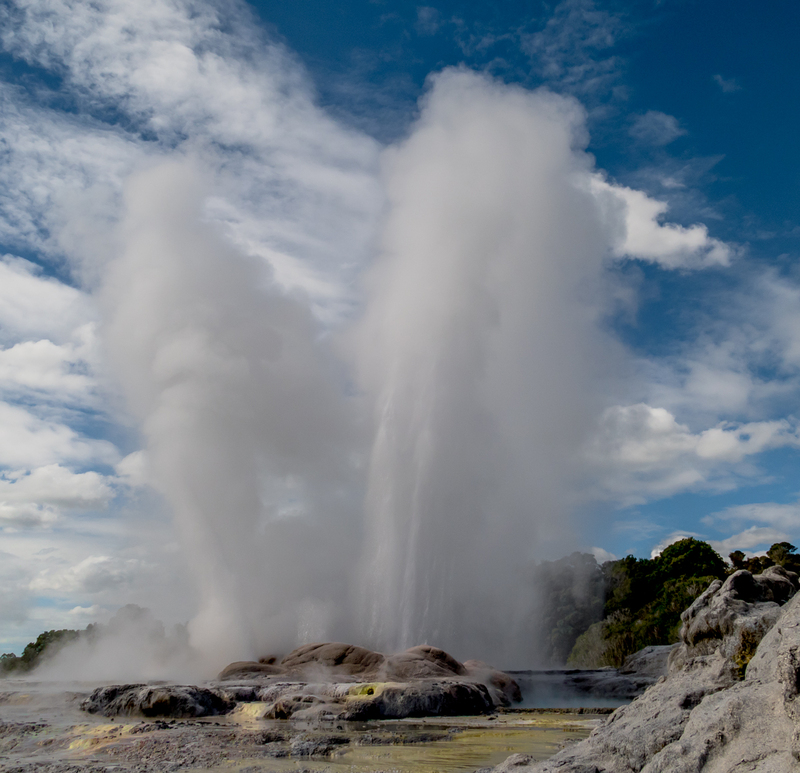 Enjoy the South Island, but make sure you return for the North Island and the geothermal fields! I am truly speechless at the beauty of these images. I am in awe how much beauty and also mysteries our little planet holds. Thank you, thank you once again, Alison and Don, for making my day and for making me think! Thank you Helga, and you’re welcome! I’m glad you enjoyed the post. The world is such an amazing place. We were pretty speechless too – so much strange beauty in such a small space. Isn’t it?! We were completely gobsmacked! What a great post! This world is so full of amazing, surreal places. 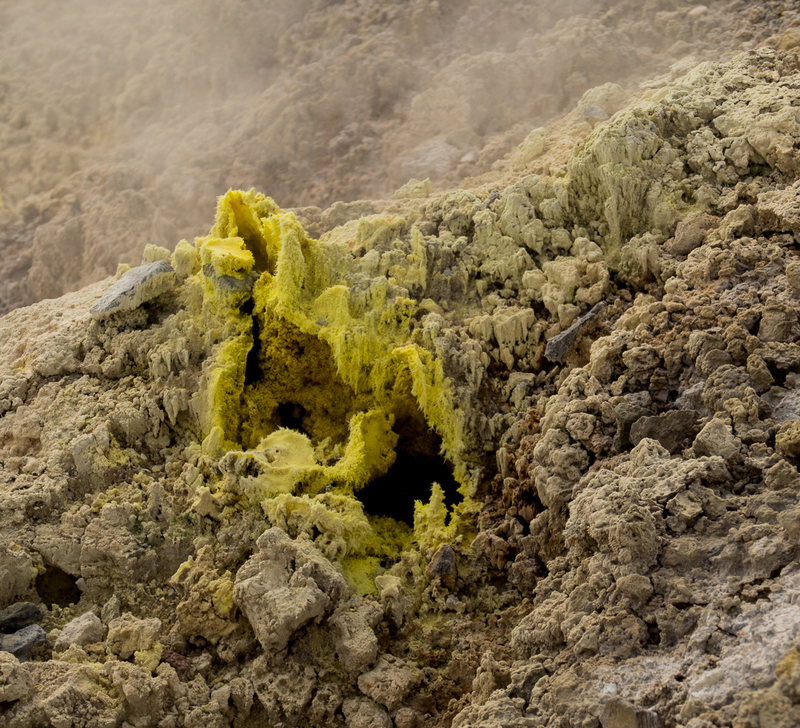 I can almost smell the sulfur in the photos. Thanks for sharing. Thanks Jeff. It was amazing to be there. Soooo surreal. Surprisingly the smell of sulphur was not that strong, but then I have hardly any sense of smell anyway. Visuals are always more important for me. at walkabout fun in this magical place. Such truth in those words, Alison. I experienced that last week in Indonesia – within the space of two days I felt my first earthquake (albeit a very small one) and then watched a volcanic eruption. The sight of that filled me with a genuine sense of awe. 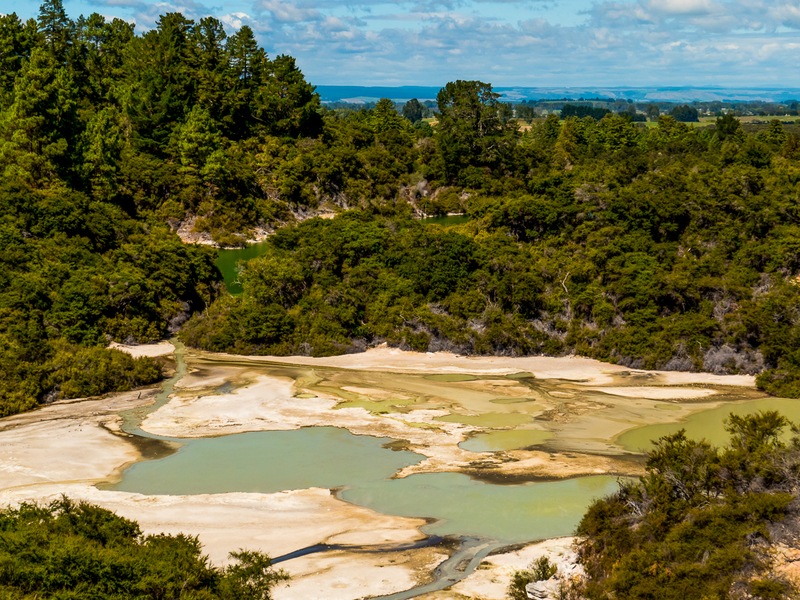 When I get to New Zealand I really must visit this geothermal valley. The sheer variety and intensity of the colours are astonishing, and I can’t get my head around the idea of underground water at 175 degrees centigrade (and still being liquid). Thank you as always for taking us along! Thank you James. Pleasure to have you along on this amazing journey. I’ve also felt a small earthquake – very eerie. I’ve never seen a volcanic eruption. How incredible that must have been. I would imagine scary, exciting, and awe-inspiring all at the same time. 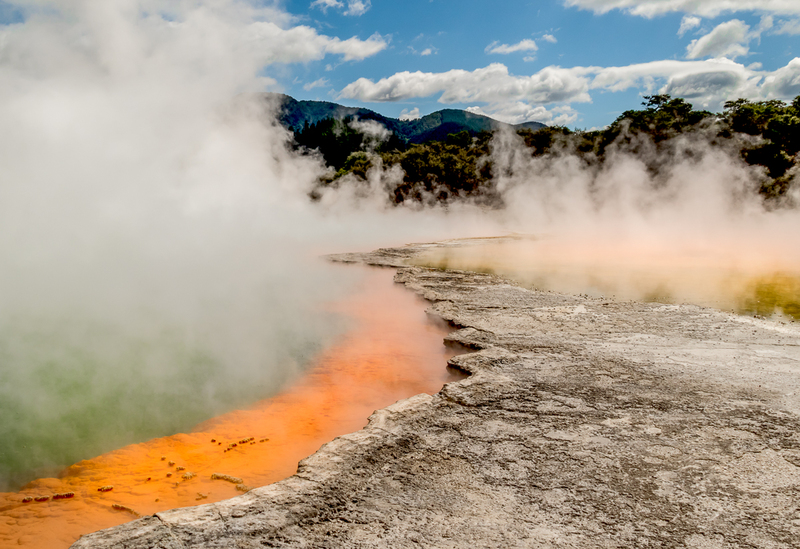 Do make sure you visit the geothermal fields in NZ when you get there – definitely one of the most spectacular things to do there. Also there is more to see than we went to if you have time. It’s a huge area that’s active, with hot springs all over the place, some commercial, some wilderness. This would be so cool to see. Your report and photographs are excellent! Thanks so much Darlene. Yes, it was *very* cool to see it. Quite amazing. My husband and I were there years ago when we visited NZ. I still remember the awful smell but it is quite a fascinating place! I loved lake Taupo! NZ is one of my favorite places on earth. I would love to live there but it is really far from home. It is marvelous! Alison, another quick comment/question. Do you download the high resolution file for your images? I can rarely get them to load fast and it never works to load when I’m on my iPhone without wifi. Just curious as I used to download hi resolutiob but got the same comments that it was very slow to load so now I use lower resolution photos for my blog. I’ve always used low res for the blog. 72ppi is plenty good enough, and I’ve never had trouble uploading except when we are in a country with slow internet. I don’t have an iPhone. I upload from my laptop. Hope this helps. Yes, I was able to get the pics on my laptop and they are gorgeous by the way. Very strange why they are so slow loading on my iPhone. I am even right outside my house on the porch! Just thought I’d check. We are getting fiber optic soon and I can hardly wait!!! Thanks pommepal. Yes, a dynamic and awesome place – beyond words really. One of the top things to see in NZ, for me anyway. I think you’ve discovered how Mars may have gotten its start. It was all going so good, and then there was a little something like this… a media blitz… and then it just got outta’ hand. No smiling faces this time, except ours as we wandered through, completely uplifted by the flowing orange metropolis. I’m afraid your comment about Mars is just too cryptic for me. Did you mean media or meteor? I was just thinking Mars is a big orange residue of what this place would probably look like after a few million years of direct sunlight… The Earth is so amazing… it has a little baby Mars on it, too! Thanks so much Susan. Yes I was completely fascinated. 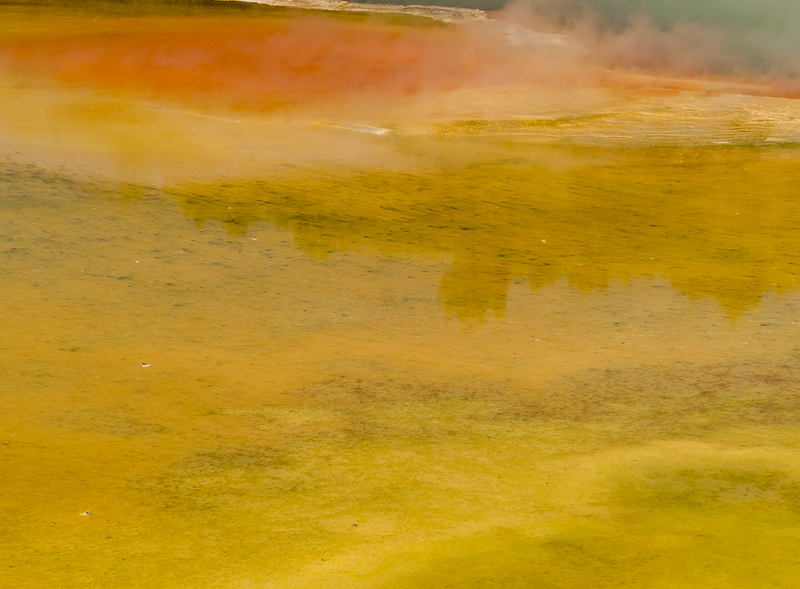 I don’t think I’ve seen such an overall extraordinary example of the ongoing effect earth’s inner heat, though I’ve heard Yellowstone is pretty spectacular. Thanks Jessie. Lovely to meet you at the dino party too! And yeah, it really is a dino landscape. It was so weird and eerie being there. The weirdest thing was the constant sound of boiling water. I love your photos! They really are amazing. The descriptions are also extremely helpful. I definitely learned some new things while reading through. i didn’t realize NZ had geothermal fields. Thanks so much Pheonix. It was a fabulous place to photograph! And amazing to just be there. Awe-inspiring and amazing! 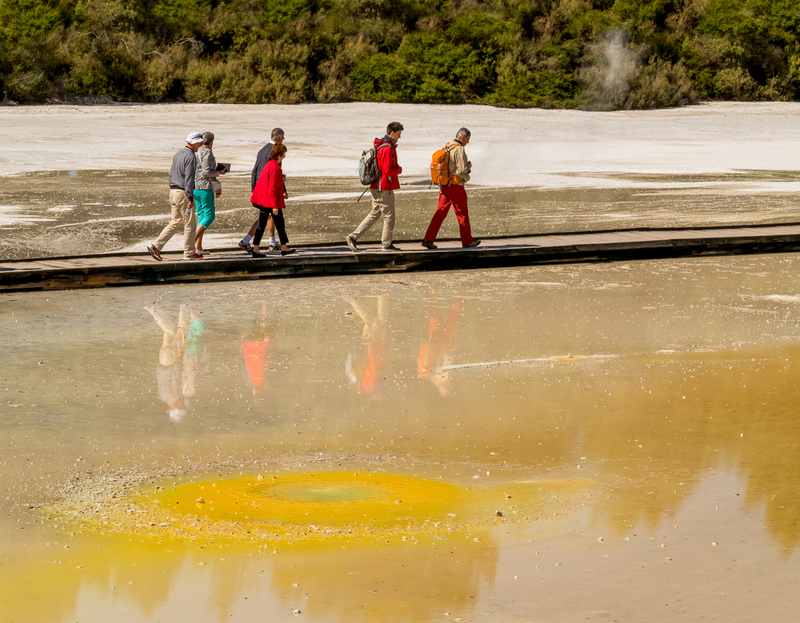 I wondered how you were walking through all that until I saw the boardwalk … are the eruptions and bubbling consistent enough that these walkways are stable and permanent? 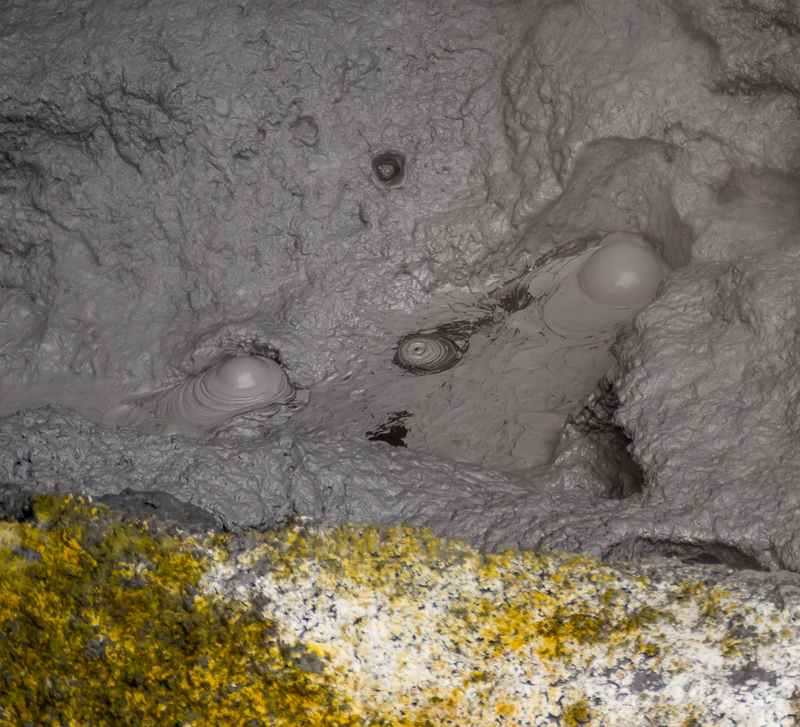 We saw some geothermal activity in Iceland last summer, but it really can’t compare with this, from what I can tell! The earth is a mysterious place, isn’t it? Thanks lexklein. It was definitely an awe-inspiring place. 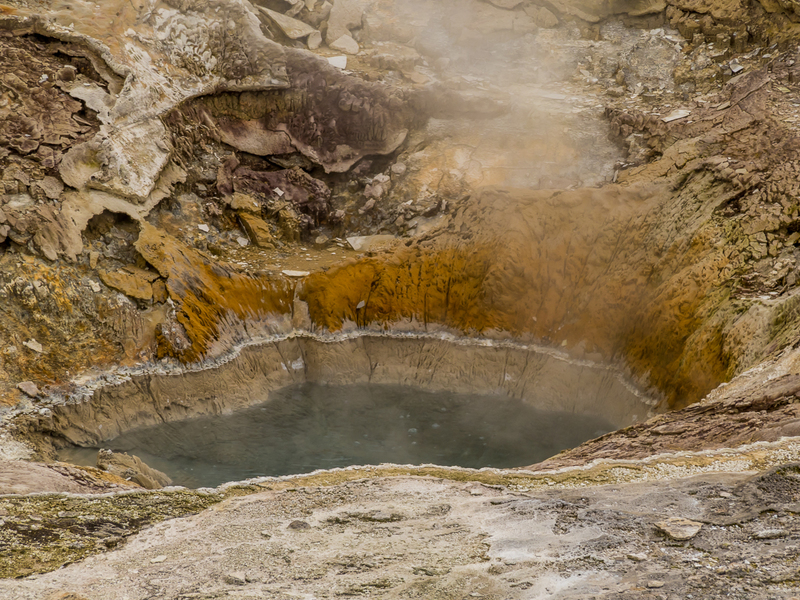 The bubbling, and the geyser eruptions are consistent, but not enough to disturb the walkways. I’m sure a major plate shift would change it all, but I guess that’s pretty rare, like an earthquake. All the pathways and boardwalks felt really stable. The constant sound of boiling water was really eerie. Magical and spooky at the same time. Wonderful photos. New Zealand really is an amazing place. Thanks Eileen. Isn’t it an amazing place?! We could hardly believe what we were seeing. Amazing colours and formations! Red, green brown, blue, yellow, orange, grey, black….. sensory overload! Yes definitely! 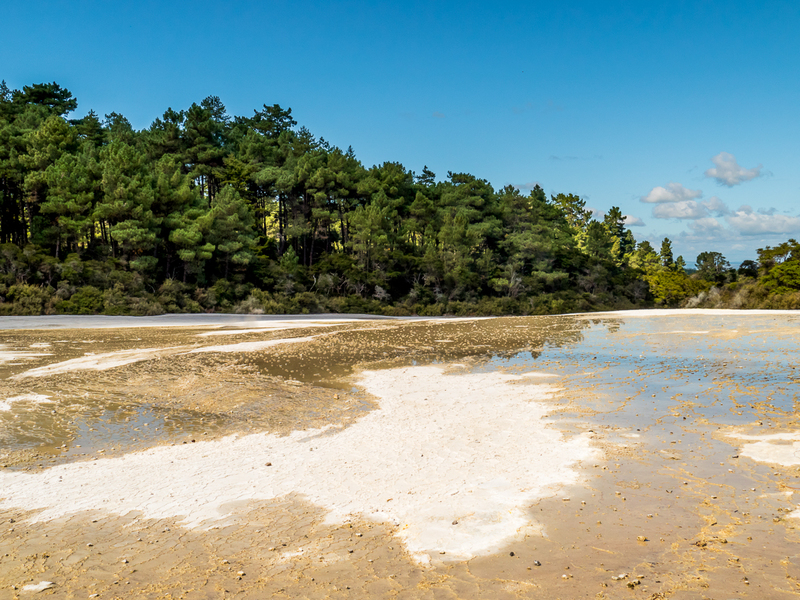 I was completely blown away by the landscape of the thermal fields. You have to see it to get the real affect of it. Amazing!